The Bollywood-Tollywood stars Prabhas and Shraddha Kapoor starrer is breaking records on all fronts even before its official trailer release! After an intriguing teaser of the star-studded film ‘Saaho’, the fans are desperately waiting to get to know more about the film. As director of the film has not released much information about the film, every single news related to ‘Saaho’ is like a feast to the fans of Prabhas, Shraddha Kapoor and Evelyn Sharma. According to reports, the look of Evelyn Sharma from ‘Saaho’ has been leaked on social media. 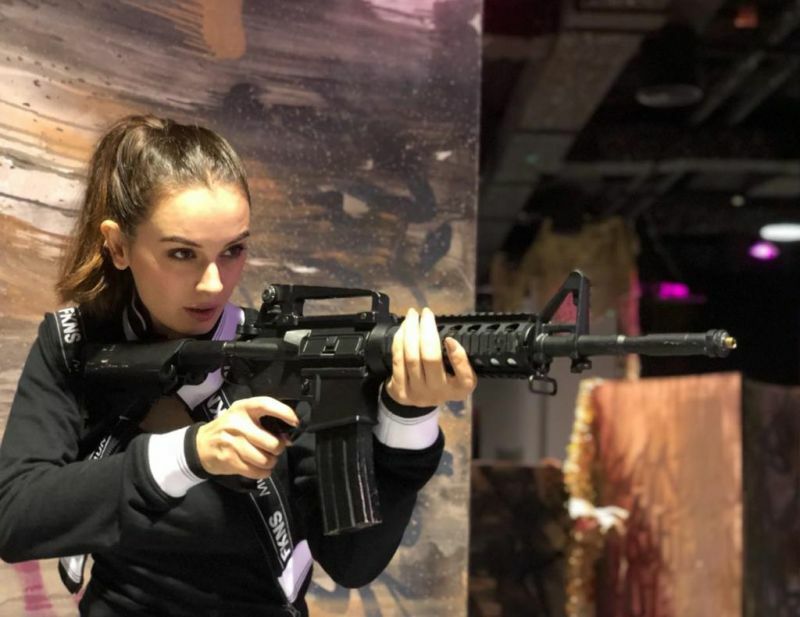 In the leaked picture, Evelyn Sharma is seen taking daredevil gun training. Looking at the picture ‘Main Tera Hero’ actress is all set to give goosebumps to the audience on screen with their mesmerizing stuns and gun firing skills. The film stars Bollywood-Tollywood star cast including Prabhas, Shraddha Kapoor, Neil Nitin Mukesh, Evelyn Sharma and several others. The teaser of the film was loved by the audience and now this ‘Yaariyan’ actress look has created a buzz among her fans. The film marks the debut of Shraddha Kapoor and Evelyn Sharma in the South Indian film. The first look of ‘Saaho’ released on 23 October 2017, on the occasion of Prabhas’ birthday and teaser of the film was released on 23 October 2018, once again on the occasion of Baahubali actor’s birthday. On Shraddha Kapoor’s birthday (March 23), the makers of ‘Saaho’ had unveiled behind-the-scenes (BTS) video of their action adventure titled The ‘Shades Of Saaho’ Chapter 2. If reports are anything to go by, ‘Saaho’ is being made on a budget far more expensive than ‘Baahubali‘ which was made on a budget of around Rs 300 crore.